The first fishing book in the English language, with the first English descriptions of fishing flies, was ‘The Treatise of Fishing With an Angle’. It was written or compiled in about 1420 by Dame Juliana Berners. A printed version appeared in 1496. Women do not re-appear in the written history of fly fishing until the late Victorian era, when British newspapers sometimes mentioned the angling success of ladies holidaying on the salmon rivers of Scotland. Wider participation by women came only slowly, hindered by social barriers and the heavy fishing tackle of the era. In Australia, women began to emerge as highly capable fly fishers from the 1930s, including names such as Tasmania’s Janet Waterhouse and Joy Chapman, and Victoria’s Kath Lyne and Mrs C. Farnbach, noted for her success at Eildon. Amongst early excellent women anglers were Mrs Thompson and Mrs Nankervis from the upper Indi. Many years ago when fishing the Geehi…I glanced over at Keeble’s Hut and saw what I took to be a huge fish hanging on the hut door. I walked over to admire it and found a top class painting of a 4.2 kilogram brown trout. An artist had painted the fish accurately from the brown which Mrs Nankervis had taken on a fly…not far from Keeble’s Hut. He also described how on one occasion while riding in to fish the Snowy River at Island Bend, his party ‘met Mrs Thompson on her way out from the river with a broken leg but still in good spirits’. Many women fished with their husbands. 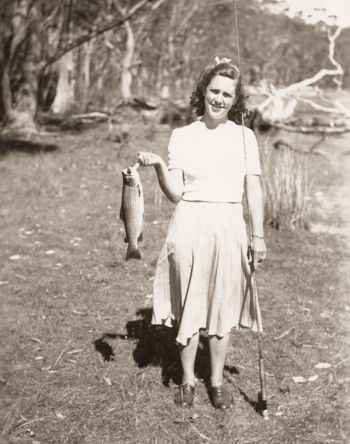 Pat Scholes learned the art of fly fishing soon after her marriage to Tasmanian angler David Scholes in 1946. While family responsibilities limited her participation, she is remembered for her ability to ‘cast a mean line’. In ‘Ripples, Runs and Rises’ (1988) David said ‘I shall never, never forget the day we waded the middle Liffey together fishing the Royal Coachman. She fished like a champion doing twice as well as I’.